Today Insurance Services offers the lowest down payment possible and immediate coverage. Owner Rocky Malphurs (left) brings over 17 years experience and is known for his excellence in service. Read more about Rocky and the agents at Today Insurance. Today Insurance offers many choices and can help find the right company to fit your needs and budget. They pride themselves on low cost auto & homeowners insurance, yet also provide condo, mobile home, renters, commercial auto, PIP-PD, SR-22, RV, boat, ATV & motorcycle. Today Insurance works with some of the most reliable companies to offer the best rates possible. Contact Today Insurance for a free insurance quote. 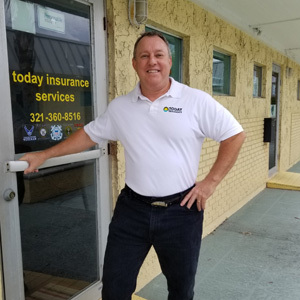 Today Insurance Services is Titusville’s and Deltona’s low cost Insurance Agency in Florida with the Lowest Possible Down Payments! We also service other areas – even out of state clients! Today Insurance Services offers peace of mind when the unexpected happens. Insurance is used to protect you from costly repairs, damages or injuries resulting from loss, of one type or another. Today Insurance offers low cost Auto insurance, Commercial Auto insurance, Motorcycle insurance, Boat insurance, RV insurance, ATV insurance, Homeowners, Renters insurance, Condo insurance, and Mobile Home Insurance Policies. We’re here to help you understand the differences between one policy to another, and comparing the benefits and premiums between each company. If you would like to know more about Today Insurance Services, please contact us!